Most adult type 1 diabetics have a daily insulin requirement of 0.5 to 0.8 units of insulin per kilogram of body weight. Approximately half of this is administered as long-acting insulin to meet the body's basic needs. The other half is short-acting insulin taken to cover the carbohydrate intake of the meals. Your doctor may have prescribed certain fixed insulin quantities for this, and you might have become accustomed to always use these insulin dosing's. where GT is the blood glucose target your would like to reach when the meal has been digested, and G0 is the blood glucose level measured before your meal. You might have agreed with your doctor to employ a specific blood glucose correction factor B denoting the amount of insulin needed for a certain blood glucose level reduction, and use a specific carbohydrate ratio CR defined as the number of carbs that can be consumed per unit of insulin. Furthermore, you might have reached consensus upon the basal, long-acting, insulin dose that works for you. Finally, it might have required some experimentation to find the proper parameters leading to satisfactory results. Nevertheless, you may already have experienced some of the limitations of this common glycemic control method. In daily life the required insulin doses appear to be rather variable and have to be updated regularly to cope with hormonal influences or lifestyle changes. This is especially the case when the body still has its own residual insulin production. It is difficult to set the operational profile of the long-acting insulin in such a way that the meal insulin and basal insulin requirements can be fully decoupled. Because of this it is often necessary to use a separate carbohydrate ratio for each meal. Here Io is your basic insulin requirement. This is the amount of insulin that you need to orderly digest the normal amount C0 of carbohydrates in your meal. In this form, the formula can also be used for the long-acting insulin. When in use, SugarPal will determine your basic insulin requirements Io for you based on your blood glucose readings. These figures will be different per meal. Moreover, just like for me, your basic insulin requirements may appear to vary considerably over a period of months. Your daily insulin requirement may vary considerably over a period of months. 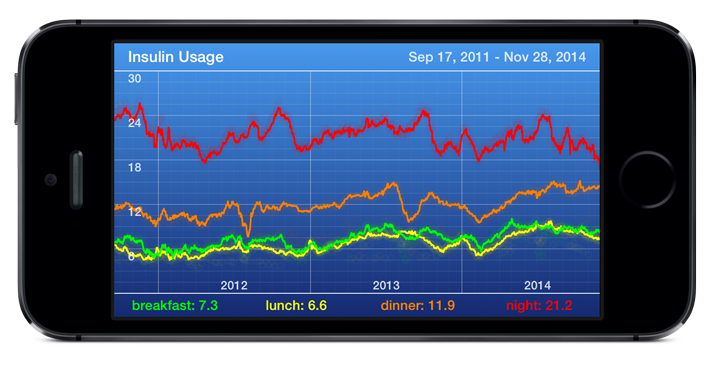 This will become clear when you rotate your screen to reveal your long-term blood sugar or insulin trends. These graphs become available after a few days of use. Because the differences in carbohydrate intake at meals are usually limited only a single carbohydrate ratio is required. This ratio is defined as the additional carbohydrates that can be consumed after an extra unit of insulin is injected. When the blood glucose level is elevated, a certain amount of insulin will ensure that more glucose is absorbed by the body than when the blood glucose level is normal, simply because there is more glucose available for this purpose. It is therefore better to use a blood glucose level dependent correction factor to ensure that the insulin dose is reduced by a larger amount if the blood glucose is too low than it is increased by when the blood glucose is too high. To achieve this, the blood glucose correction factor in the SugarPal Diabetes Manager application is defined as the amount of insulin necessary for the blood glucose level to decrease by a factor of 2.7. This is different from the traditional glycemic control method wherein the blood glucose correction factor is defined as the amount of insulin required to adjust the blood sugar level by a certain value. Your blood sugar targets can be adjusted in Settings - Users - Medications. Depending on your personal situation, you may need to use a somewhat lower or somewhat higher value in the recommended range. For each insulin dose you need to indicate the amount of carbs usually consumed and the time period after which you wish to achieve a particular blood glucose target. It is convenient to use the next dosing moment for this. A settings example is shown below. Here the short-acting insulin is injected before breakfast and lunch, but after dinner. The values in the column "After" need to be adjusted when you prefer to eat and inject your insulin's at different times. 08:00 (8 AM) breakfast 100 7 mmol/l 5.5-7.5 6.5 (117) 4 hrs. 12:00 (noon) lunch 125 6.5 mmol/l 4.5-7.5 6 (108) 6 hrs. 18:00 (6 PM) dinner 120 6 mmol/l 4.5-7.5 7.5 (135) 4 hrs. 23:00 (11 PM) night 0 7.5 mmol/l 6.5-8 7 (126) 8 hrs. You may be used to eat more or less the same amount of carbohydrates at every meal. It is recommended to enter this value in Settings - Users - Medications to let SugarPal use it when determining your basic insulin requirement. When you consume the same fixed amount of carbs at each meal the "Carbs" switch allows you to disable the carbs adjustment picker. In this way your "normal" carbs amount is used automatically, allowing a faster "two-tap" entry of your insulin dose. Generally, however, a better control of the blood glucose levels can be achieved using this carbs adjustment picker to enter an accurate estimate of the actual amount of carbs in your meals. Installing a separate third-party carb-counting app for this purpose could be worth considering. The carbohydrate ratio and blood glucose correction factor can be adjusted in Settings - User - C/ I ratio and Settings - User - BCF. Since the carbohydrate factor is only used to calculate insulin dose adjustments if you deviate from your usual meal carbohydrates, you can select a higher value as in the traditional glycemic control method. To determine your carbohydrate factor the amount of carbohydrates in the meal must be divided by the amount of insulin usually needed to maintain a steady blood sugar level. Take the largest value when the different meals yield different numbers. Depending on your insulin sensitivity you should get a value between 10 and 25. Because the blood glucose correction factor in the SugarPal Diabetes Manager application is defined as the amount of insulin needed to reduce the glucose value by a factor of 2.7 it does not matter whether you keep track of your blood glucose values in mmol/l or mg/dl. Please note that the values proposed here for the carbohydrate ratio and blood glucose correction factor may still require some personal adjustments. This will especially be the case when the body still has some residual insulin production of its own. Therefore, upon first use a rather small blood glucose correction factor and a rather large carbohydrate ratio is set so that initially the recommended adjustments in insulin dose will be on the safe side. very long Lantus 20 hrs. Consult the leaflet if the type of insulin you are using is not listed in this table. SugarPal calculates insulin in tenths of units to offer an accurate dose advice. The NovoPen Junior I am using currently, allows me to dose this insulin within a tenth of a unit by gently turning back the dosing button before the insulin is injected. Unfortunately, this insulin pen is no longer available, and you will probably have to use a pen that can dose in half units of insulin at best. It is a pity that the need for more accurate insulin dosing is so little recognized by the pen manufacturers. Perhaps the competition from insulin pumps is too strong. Therefore, unless you are lucky to have a NovoPen Junior, depending on your insulin sensitivity, you may need to tune your carbohydrates every once in a while a bit to get sufficiently close to your target blood sugar value with a rounded-up insulin dose. Activate the "Carbs" option in the settings to enable this. These pens have half-unit increments. I use them myself to dose within a tenth of an insulin unit. Unfortunately, they are no longer available. Instead, you may have to tune the amount of carbs taken with your meal a bit every once in a while. Actually, SugarPal's insulin dose calculations are more complex then described above because the differences in acting time between the short-acting and long-acting insulin's must be accounted for. These details are described below so that you can get an idea of what the application can do for you. To properly account for the long-acting insulin, SugarPal considers the joint effect of the last 12 insulin injections when determining the active insulin IA in the time period between two blood sugar measurements, running from t0 to t1. For this purpose, an exponential decrease of the insulin activity is used in proportion to the duration of action d, and then the active insulin is calculated using a summation over the last 12 insulin dosing's ID taken at time t.
It is assumed that the length of time in which the meal is digested approximately corresponds to the duration of action of the short acting insulin, and that the duration of action of the long-acting basal insulin suits the insulin requirement during the night. This makes it possible to calculate the insulin need IN in a similar way. Because these durations may not quite match, a possibility to bring differences into account is provided. However, unless you have a continuous glucose meter and want to adjust everything precisely, the offset parameters oi can better remain at zero. The exercise correction factor Ecf,i takes a reduced insulin requirement in account if you want to workout. This is the insulin dose SugarPal will suggest you to take, since, based on the data known to the application, this will steer your blood glucose level back to target. However, obviously, you are free to choose differently. When you enter a new blood glucose result, SugarPal will propose the expected blood glucose level. You only need to adjust this to the actual measured value. or for a recalculation of the exercise correction factor Ecf, so that your blood glucose level will be better next time. The quality of your blood glucose regulation is one of the factors that defines your quality of life. If you take customized insulin doses to correct occasional high blood glucose values immediately, you will feel better, and you reduce the risk of diabetes complications. If, when doing so, you simultaneously manage to stay away from frequent low blood glucose values, the chances of developing a dangerous level of "hypoglycemia-unawareness", where you no longer notice your lows in time, are low. To compare the quality of the blood glucose regulation that can be obtained with the SugarPal Diabetes Manager application with that of the traditional 4 times daily basal bolus regime, both approaches have been evaluated through computer simulations. For the traditional daily basal bolus regime it is assumed that the basal insulin dose and the carb ratio's have been set at their optimal values in consultancy with the diabetes care team, and remain unaltered throughout the 3 month simulation run. Put differently, fixed insulin baselines are being used. For the SugarPal regime, dynamic insulin baseline optimization is continuously applied, using baseline adjustments calculated from the observed blood glucose fluctuations. For both approaches the blood glucose correction factor is varied around its "optimal" value, to evaluate its effect on the quality of the blood glucose regulation. Results of computer simulations of the blood glucose regulation. Over a period of 3 months, the dynamic insulin baseline adjustments of the SugarPal regime result in four times less fluctuations in the blood glucose level compared to working with fixed insulin baselines as in the traditional basal bolus regime. The correlation coefficients provided in SugarPal's email back-up can be used to verify whether the correct blood glucose correction factor has been used during the insulin treatment. In the computer simulations, it is assumed that the remaining own insulin production varies according to a Gaussian "random walk", just like stock prices. Consequently, this will also be the case for the insulin that has to be added. Even when there is almost no own insulin production anymore, it is not unlikely that this remains to be the case for the external insulin requirements. 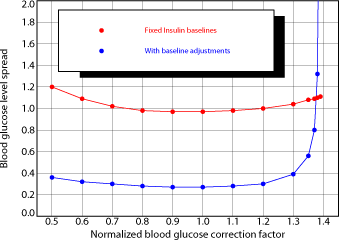 The blood glucose correction factor used here, is normalized with respect to the "correct" value. Therefore you can not simply copy its value. A selection of results of these computer simulations is shown in the graphs above. The main conclusion is that, when viewed over a period of 3 months, SugarPal's default dynamic insulin baseline optimization reduces the fluctuations (spread) in blood sugar levels by a factor of four compared to the traditional insulin therapy, where fixed insulin baselines are used. Furthermore, although this is not shown here, the desired blood sugar targets are better met. To minimize your blood glucose fluctuations you need to use the proper blood glucose correction factor. To help you assess whether this is the case, SugarPal provides you with the cross correlation coefficients between your successive blood glucose measurements in each email backup. Positive cross correlation coefficients imply that your blood glucose fluctuations are not sufficiently corrected for, and you should set a somewhat greater blood glucose correction factor. Negative cross correlation coefficients indicate that your blood glucose fluctuations are generally overcorrected, and you would be better off using a smaller blood glucose correction factor. 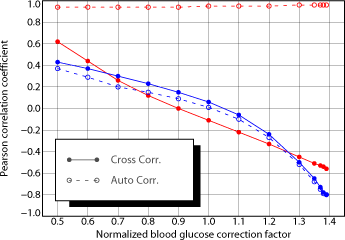 In the above graphs, the connections between these correlation coefficients, the blood glucose correction factor, and anticipated blood glucose fluctuations, as found through the computer simulations are shown. It will be clear that the cross correlation coefficients calculated by SugarPal are a powerful tool for determining your individual blood glucose correction factor, and finding the optimum settings for your blood glucose level control. A blood glucose correction factor yielding cross-correlation coefficients around zero is optimal. When using a too large blood glucose correction factor the blood glucose control will become unstable. You need to be careful here, because there is only 30 % difference between the optimal blood glucose correction factor and a correction factor for which your blood glucose levels can go out of control. This situation can be recognized when the cross-correlation coefficients between successive blood glucose readings have become less than -0.5. This is a clear sign that you need to set your blood glucose correction factor a bit smaller. Comparing the auto correlation coefficients between blood glucose measurements of the same type done on consecutive days, as also calculated by SugarPal, with the cross-correlation coefficients, you can gain even more insight into the course of your blood glucose control. In particular, this will help you judge the role of the dynamic insulin baseline optimization, which should ensure that both types of correlation coefficients are equally low. This application is primarily intended to help you to keep track and improve your blood sugar control in an easy way by recording your blood sugar levels and insulin dosages. The insulin doses and estimated blood glucose values are calculated based on generally accepted knowledge concerning the influence of the carbohydrate in meals and physical activity on blood sugar levels. To achieve this, the appropriate personal settings must be entered. This will require some experimentation. Do not use insulin doses outside of the bounds agreed upon with your diabetes care provider and keep in mind that during the first days of use and after readjusting your settings, the application may give incorrect dose recommendations. Unforeseen situations in which it is better to trust your common sense or professional medical advice may occur at any time. This application therefore cannot replace professional medical supervision. Make sure you understand what you are doing and when in doubt always consult with your doctor or diabetes care provider. SugarPal Diabetes Manager is uncertified medical software. It is believed to be fit for its purpose, but it has not been tested according to standards that could be defined in the foreseeable future to certify that this is indeed the case. Therefore, by using SugarPal Diabetes Manager, you agree to assume full responsibility for your healthcare and for your blood glucose regulation in particular, and you agree that SugarPal and its developer are not liable for any direct or indirect consequences of any result returned by the application. Your privacy is important. Therefore all medical information entered into the application is stored on your own iPhone only, and, if enabled, as encrypted back-up on Apple's iCloud servers. It is entirely up to you to decide whether you would like to share a recent selection of blood glucose and insulin records via email with your doctor. SugarPal does not sent out any information about app performance, usage, or errors in the background, except for what you might have authorized Apple to collect as part of its app improvement program.